Sasayaki Glitter Stamps has a Facebook challenge starting today! The theme is Anything Goes! 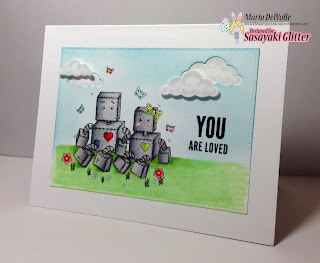 My project for this challenge is super sweet robot couple!! Aren't they cute? There are so many super cute stamps at Sasayaki Glitter store!! I hope you visit and see for yourself how adorable they are! The illustrator has such a unique style! I hope you like my project and that you guys like it! I hope to also see you participate and enter your project in the challenge blog! Until next time and get crafty! What a fun card. Adorable scene! Thanks so much for sharing with us at Word Art Wednesday! !